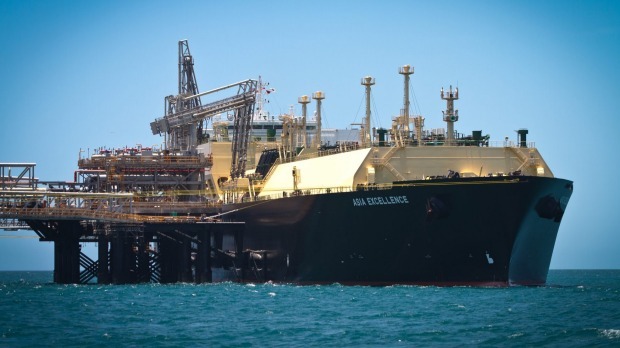 The Asia Excellence transported the maiden cargo from Chevron's Gorgon LNG project in Western Australia on March 21. The maiden cargo of natural gas from the gigantic Gorgon project off the coast of Western Australia set sail for Japan last week. After all the delays and the enormous costs blowouts it was quite a milestone. Even though this is one of the world’s premier resources projects and a marvel of engineering, its contribution to the Australian economy has been overblown, much in the way Indian conglomerate Adani has exaggerated the benefits of its Carmichael coal project, or the Gladstone LNG triumvirate has positioned itself as the nation’s next export saviour. The national dialogue, in short, has been distorted by self-interest, often to deflect criticism that multinationals operating in Australia do not pay their fair share of income tax and royalties. Real returns from Gorgon are likely to be less than half that. The ACIL Allen report on which oil major Chevron, the operator of the Gorgon project, bases its claims, seems to have become accepted wisdom. Yet its assumptions are old, overly optimistic and ought to be questioned. Massive numbers, though numbers most unlikely to stack up. For a start, Chevron’s oil price assumptions are $US70-75 a barrel, not $US40, where they stand now, and because the price of gas is linked to oil, and there is a global gas glut, the forecast benefits would appear to be exaggerated. It is true that few foresaw the dramatic slump in the price of oil. Still, expectations of taxes and royalties ($338 billion in revenue) are ebullient, even at $US70 a barrel. Chevron has said it has paid more than $3 billion in Australian taxes over the past five years. However, its annual filings to the Australian Securities and Investments Commission over that period (2010-2014) show that $677 million was paid in Australian corporate tax, equating to an effective tax rate of just 7 per cent. It seems the oil major might have taken the usual leaf from the resources lobby playbook and included GST and payroll taxes, and perhaps included the contributions from its contractors and project partners. We do know, from Australian Taxation Office data disclosed in December, that in 2013-14 zero was paid in PRRT royalties. And given the PRRT tax credits amassed from Gorgon and Wheatstone investments, it is fairly safe to conclude that PRRT was not paid in the earlier years. The cost overruns and delays will also delay the payments of taxes and royalties, another factor that does not appear to have been included in its public pronouncements. It is likely that Chevron Australia is gearing up now for huge write-downs. Woodside reported in February that it had written down Wheatstone by $865 million. Woodside holds 13 per cent of the project. Because Chevron holds 64 per cent, it might even face one of the biggest write-downs in history – the Woodside equivalent would be $4.265 billion. Though pro rata, Chevron’s write-downs might need to be higher than Woodside because it is more highly geared and it deployed mostly related party debt for construction of Gorgon and Wheatstone. Moreover, the interest on that debt – to its own associates – is at higher rates. A Fairfax investigation in 2015 found the PRRT delivered $1.2 billion to government coffers in 2003-04 but is destined to raise just $1.4 billion when the industry reaches peak production in about 2019. This was confirmed by the Australian Taxation Office. Goldman Sachs chief economist Tim Toohey earlier estimated the resources rent tax would deliver “no additional PRRT revenues over the coming decade” at least. Then there is tax. Given the $35 billion in related party loans from Chevron’s US parent, and its Byzantine transfer pricing arrangements, it would be strange to conclude the oil major would be tipping in more than pocket fluff in corporate income tax in the course of the next decade.